This is a quotation from the Battle of Maldon. 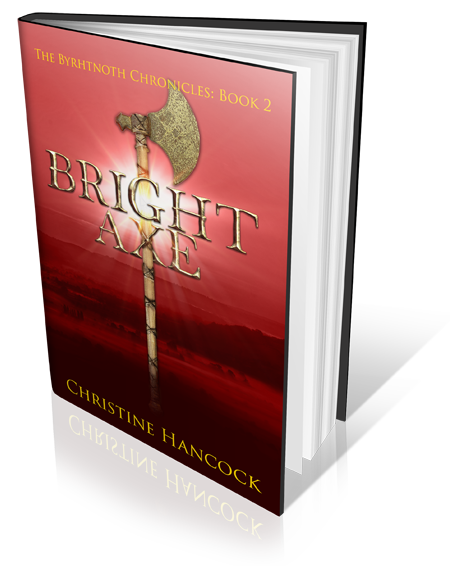 Byrhtnoth is dead and his kinsman Aelfwine encourages the warriors by reminding them of their boasts in the Mead Hall and how they must now make good their promises. Today I am not talking about battles, but of mead. Almost the first thing we were told at the “Building a Shieldwall” session at the Historical Novel Society conference was “Anglo-Saxons didn’t drink mead!” A good way to catch the attention of the audience. What I think they meant was that the mead that was drunk was very different from what we think is mead; a thick fortified wine manufactured by monks. What was it they drank? Anglo-Saxon Food & Drink by Ann Hagen has a useful chapter on Fermented drinks, but I was looking for something I could make myself. 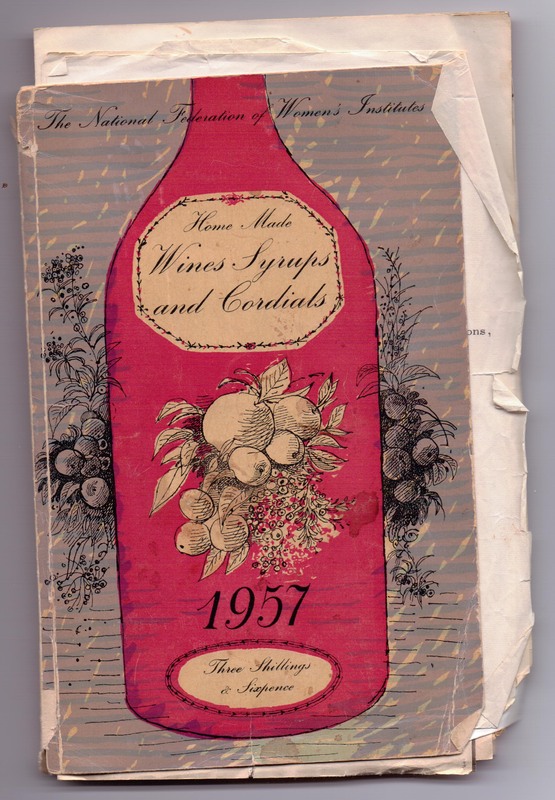 I looked in my father’s old wine making book – honey, water and mead yeast. I found a recipe online using a milk bottle and a balloon. Perhaps I would have a go. This is the time of year I get an urge. An urge to wander the local hedgerows and gather the abundance that is to be found there: blackberries and elderberries, sloes and crab apples. I then have a furious session of freezing, jam making and most important, wine making. Here is a post from a different blog of an autumn a few years ago. What would the Anglo-Saxons have done with a harvest like this? It couldn’t be frozen – unless the winter was particularly cold. They wouldn’t make jam – there wasn’t the sugar available – although they might have cooked fruit and preserved it in honey. There was no gin, so no sloe gin! Foods could be dried, perhaps larger fruit, such as apples, plums. Salting would be okay for meat and vegetables, and smoking, but not for fruit. What to do with those juicy blackberries? Throughout history a lot of foods (most?) were seasonal. When it was available you ate as much as you could, then waited for next year. Nowadays we can eat whatever we want, when we want it and we have lost our connection with the turning of the seasons. Would we appreciate things more if we had to wait for them? Back to the Anglo-Saxons. They were a practical people. They would not want to waste anything – and they liked to drink! Any fruit that could not be consumed immediately would be used. Apples would be pressed to make cider. If they had grapes, wine would be made (there would have been vines surviving from Roman times.) Once you know how to ferment apples or grapes, you can do the same with other fruit. Your surplus honey would be used for mead. You would improvise – use what ever you had. This year I had pears They started to appear in the kitchen. 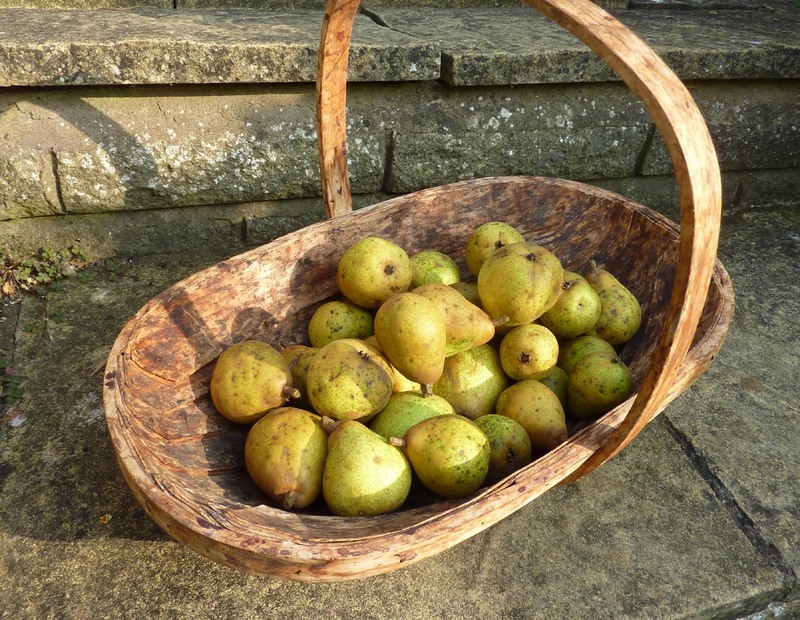 Apparently it is a particularly good year for pears, at least in our garden, and these were the first windfalls. Pears are a tricky fruit, difficult to tell when they are ripe. If you catch them at the right moment, they are delicious. Unfortunately that moment lasts for only a few minutes, earlier they are hard as a rock, later a soggy mush. What to do with them? Jam? We don’t eat much jam and I think I still have some jars from the last glut. There is a limit to the amount of Pear Crumble you can eat, believe me — there is. It had to be wine. 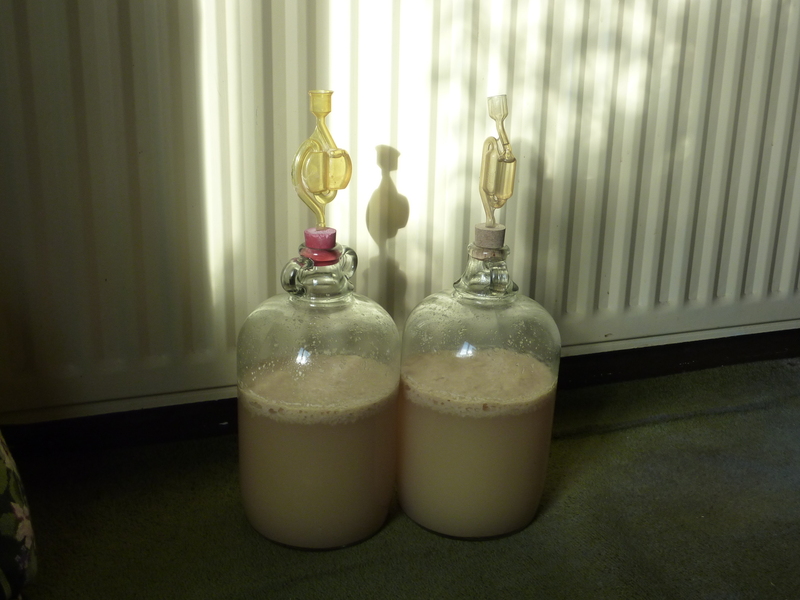 My thoughts about mead and Anglo-Saxon wine making had fermented in my brain. I would make wine, but not wine as I usually make it. 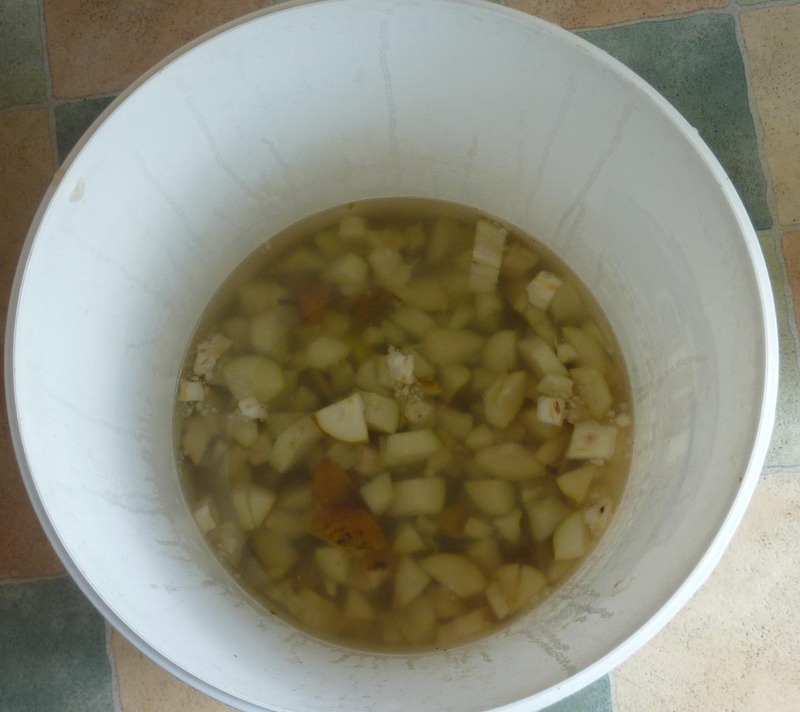 When looking for Pear wine recipes, I had found one for Homemade Pear Mead I would have a go. A chopped my pears and poured over the boiling water and added the various chemicals – I wanted to be authentic, but not that authentic. Chopped pears soaking in water. The recipe said to add the yeast the following day. This didn’t seem right, my usual method is to soak fruit for however long, strain, add sugar and then yeast. I think I was right as there was no fermentation, just a nasty grey scum on top. A week later I strained the liquid and added the honey (and more yeast). Within an hour or so it started bubbling! The recipe says to rack every three months for a year, then bottle and leave to rest for another year. Can I wait that long to taste it? Great post, Christine. Maye I’ll try with the crabapples outside my writing office. I still have enough crabapple jelly from last year to last a decade, and crabapple mead does sound more pleasurable. But like you, can I trusted to wait for a year before sampling – unlikely! Thank you Karen. I can definitely recommend crabapple wine. I’ve only made it with sugar before, but imagine honey might be better. As to when you drink it – well you’ve got to check that it’s OK! Sorry, but I think I would be able to resist trying for a very long time but, then, the only time I tried wine making, I took off a chunk of my index finger so I really do not have good experience in this area. Sorry to hear that. Accidents usually happen after I drink it, not before.